DJs know that ear-splitting volume is an occupational hazard, and they protect their ears accordingly. If fans leave the house without their plugs, it’s the rare festival or club that offers the purchase of good earplugs. That appears to be changing, as concertgoers are increasingly seen sporting a variety of hearing health solutions. A 2015 World Health Organization study declared over a billion young people are at risk of noise-induced hearing loss, and some appear to be listening. Etymotic Research, established makers of high-fidelity hearing protection and personal audio products, is at the forefront of this wave of new hearing health solutions. 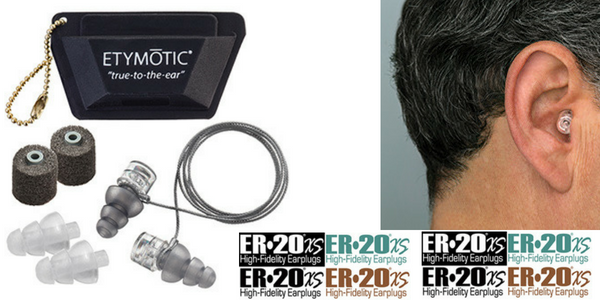 Their ETY•Plugs® and ER20•XS® earplugs are the world’s highest fidelity non-custom earplugs. They reduce most noise to safe levels while preserving the clarity of speech and the richness of music. Both products are configured to replicate the natural response of the ear canal so that when sound enters the earplug, it is reproduced unchanged, exactly the same as the ear would hear it, only quieter. The newer ER20•XS earplugs have a discreet, stem-less design, which allows them to be worn with hats, headphones and other headgear. Professional musicians, serious concertgoers, and others who want a more long-term solution invest in custom Musicians Earplugs™ or in Music•PRO® electronic earplugs, which automatically adjust output levels as sound input levels change. The Etymotic line of hearing protection is increasingly showing up wherever DJs are rocking the rafters, or outdoors keeping the wildlife far, far away. From behind turntables to the spaces in front of speaker arrays, Etymotic is helping EDM DJs and their fans turn thumps down, so they can wake the next morning fresh and ultimately dance another day.